Why wear a basic looking black blazer or tuxedo jacket when you can wear something fun by Manzini. Manzini has their Insomnia collection of fashion blazers and tuxedo suits jackets that always have style and fun to offer. 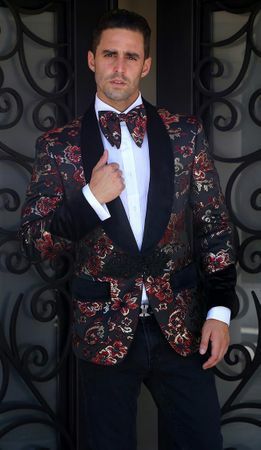 This unique looking tuxedo blazer features a red floral pattern woven fabric with velvet trim contrast. The jacket has side vents and the bow tie made of the same fabric to match.